Hi! I’m Jarron Slater, and I teach and research technical and professional writing and rhetoric. If you have any questions, please contact me. Thanks for stopping by! Oh, and by the way, this website also has a few blog posts and summaries of texts that I wrote while I was a graduate student. They might be a bit juvenile, but they might also still be useful to someone, so you can find them here. You can also view my Academia.edu profile. Posted on March 14, 2018 March 16, 2018 Author adminCategories UncategorizedLeave a comment on Welcome! I’ve recently received word from Taylor & Frances Online that a book review I wrote was published in the Journal of Religious and Theological Information. As one who studies rhetoric and is pursuing a PhD in Rhetoric and Scientific & Technical Communication, I thought it would be appropriate to review a book called The Rhetoric of American Civil Religion. According to Taylor & Frances Online, the first 50 people to click on this link can access the article: http://www.tandfonline.com/eprint/9jIhcGg8jKujBXVQ6nww/full. I’d be interested in hearing your thoughts. So check it out, send me a message, and have a great day. How do people become writers over time, and how writing is situated within identity construction? In this case study, Compton-Lily follows Peter, an emerging African American writer from a low-income community from first-grade to high school. Compton-Lilly collected data from interviews, field notes, and writing samples while Peter was in 1stgrade, 5th grade, 8th grade, and 11th grade. She then coded data from each data collection, identifying salient categories of information, and then coding data from the first and third collections into grounded categories organized by contrastive analysis. As Compton-Lilly considered the patterns, she was led to Bordieu’s notion of habitus, which emphasizes the identity dispositions people create over periods of time, and from which she develops the concept of a writing habitus. She found that Peter’s writing habitus consisted of four developed dispositions: meeting school expectations for reading and writing, being a good student, forming friendships and affiliations that involved reading and writing practices, and future goals that related to writing. Becoming a writer cannot just be about learning thesis statements or grammar, but is also related to dispositions which focus on individual purpose and social belonging. Social affiliation should be fostered inside the classroom and promoted outside the classroom. Compton-Lilly, C. (2014). The development of writing habitus: A ten-year case study of a young writer. Written Communication, 31, 371-403. Ginzburg’s Rhetoric, History, and Proof. At the beginning of this short book, Ginzburg says that he wants to know what history, rhetoric, and proof have in common. He says that history and rhetoric obviously have something in common, but what about proof? That seems to be the unlikely term. Yet, Ginzburg demonstrates that proof used to have something to do with both rhetoric and history—it was central—and that fact reveals the methodology of historians. Rhetoric is therefore naturally the term between history and proof. One example of this appears in Chapter 1, when Ginzburg states that Aristotle’s Poetics and the Rhetoric reveal how history, proof, and rhetoric were closely connected with one another. Carlos Ginzburg. Rhetoric, History, and Proof. Hanover and London: Brandeis University Press, 1999. Posted on March 20, 2017 August 25, 2017 Author Jarron SlaterCategories Brief Summaries, RhetoricLeave a comment on Ginzburg’s Rhetoric, History, and Proof. Thinking about Rhetoric while Shopping at the Grocery Store: Food or Plastic? Apparently somebody thought that this is something that would sell. Not just “somebody,” but an entire group of people believed that a number of other people would want to pay money for it. The product is basically a small container that has 3 compartments containing a variety of fruit, cheese, and some other kind of snack. These were normally $1.89 but the price had been marked down to $1.00. Each product has around 1.5 ounces of food–and some of that weight of course consists of the plastic that it takes to make the 3 containers of food. I picked one up and wondered if the people who purchased this would be buying about equal amounts of plastic and food, but it was of course hard to tell. Iron could have been added to the granola to further increase the product’s weight, but I didn’t look, and I don’t remember. Whatever happened, the food would be eaten, and the plastic would be thrown away. 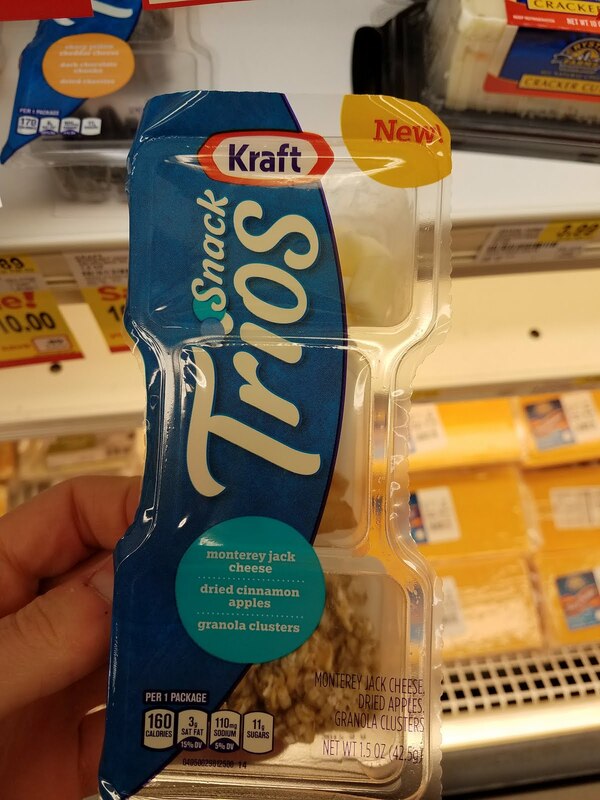 The product is for people who want a quick snack and who are trying to eat a certain type of diet, but it’s also for those who may not think much about the amount of post-consumer waste to which they are contributing. I am curious about the circumstances that provide the possibility of this product’s existence in the first place. I mean, for the same price, I could buy an entire apple and a whole chocolate bar–so why would I instead settle for a plastic container with tiny bits of dried apples and little chunks of chocolate? Maybe I would do it for the convenience. Maybe I would do it because of the appearance of variety and efficiency. But if I considered the act of purchasing and all its rhetorical implications, I don’t think I would be persuaded to put the product in my shopping cart. I wasn’t. Posted on January 16, 2017 August 25, 2017 Author Jarron SlaterCategories UncategorizedLeave a comment on Thinking about Rhetoric while Shopping at the Grocery Store: Food or Plastic? There are always dark nights and cold winters in our lives, but these dark nights and cold winters don’t last forever. Like it has this morning, the sun eventually rises, and light disperses the darkness. And while in a few months, winter will come and it will bring snow and storms as it usually does, eventually, winter will give way to spring, and with it will come new warmth and new life. Then the trees that are now losing their leaves will begin to grow new ones. Recent events may bring with them new challenges, but it’s not the end of the world! Let’s learn what we can from our experiences by getting to work! Maybe we can start by spending a bit more time getting to know some of the people in our very own neighborhoods. What about the people next door? Who are they? Who in our very own communities needs a helping hand, a warm smile, or a listening ear? We can start by going out and showing people that we care–especially those who feel like they have been pushed to the sidelines. As we come to know the people who live in our own neighborhoods and communities, we will discover that there is not a shortage of people who need our help, and that there is much that each of us can do to show that an individual is appreciated and that, as a human being, theirs is a dignity that cannot be taken away. To show that respect and not just to say it is itself a language that must be learned, and speaking that language involves more than just the lips (or the fingers)–it is spoken especially from the heart, but it involves the entire self, for it is a language that is really spoken as it is enacted. And it can be enacted by freely giving of one’s time, talents, and energies. Life is so much more than sitting in a room by one’s self and reading endlessly! 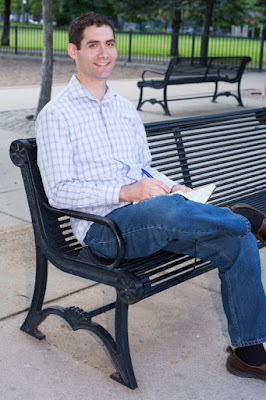 A few weeks ago I was sitting on a bench in Holmes Park writing in my journal when a woman approached me and asked me if she could interview me and take my picture. She said her name was Stephanie Glaros and that she was from Humans of Minneapolis. One of the things I appreciate about Stephanie’s work is how she is telling so many stories about so many people. Her work shows that all of us have something interesting to talk about, and that we all have a story to tell. Not only that, but by listening to the stories of others, we enable ourselves to empathize with them. There was once a man who was sitting in a public place. Soon, he was joined by a friend, and finally, a third man approached. The third man didn’t say anything, but stood there for a minute until he pulled out a package of cookies. The first man couldn’t help but think to himself, “Great–I was just getting a bit hungry!” He began to subtly smile as the third man opened the plastic package. The third man then pulled out a cookie and gave it to the second man. So the first man began to salivate as he soon expected that a cookie would soon be handed to him, too. He waited. The third man did indeed pull another cookie out of his bag, but he did not hand it to the first man. Instead, he simply took a bite out of it. Then he closed the bag, returned it to his backpack, and walked away. Naturally, the first man was confused. And he was now only hungrier than before. There once was a student who was enrolled in a class which had a comprehensive final exam. The student, however, did not study for the exam.